I am on a reading project this year, where I try and attempt to read fifty books in the course of the year (more details here) and although I am slightly late in running the contest, I just finished reading my first of the fifty, a masterpiece from Dr. Atul Gawande, the surgeon who wields words with the the precision of a scalpel. I just finished reading his latest offering, Being Mortal: Medicine and What Matters in the End, a riveting read by all means, and especially for me, because of two reasons: first, the recent events in my life which have sort of primed me to this kind of a text, and second, my experience of working in a critical care unit, the so called crib of death. In the book, AG dwells on length about issues regarding assisted living and continuum of care for the elderly. He talks about the numerous revolutions and ideological changes in the philosophy that governs the care of the elderly. He bemoans the fact that trained Geriatricians are hard to come by in the US, as well as in the developed world as a whole, while lamenting the fact that old age, and the accompanying limitations imposed by it, have not been well managed by the medical and caregiving community. He has also lightly touched upon the break down of the traditional family system, where the elderly are respected and beloved members of a large, joint family, and stated that with the financial independence and development of individual emancipation, there has been a societal shift where the norm has shifted to assertion of independence (both by the elderly parents and the youthful children). While I do not get behind this assertion with full agreement, I can see the logic he is driving home. Anyway. Without going into a plot dissection, which would result in a post that would run into thousands of words, I would just say that the book is probably the best Gawande work yet. I must say I was slightly disappointed after reading The Checklist Manifesto, which felt like it dragged on well after the main issue had been milked, but this book has more than made up for that feeling and has reinstated Gawande to the pedestal he always held for me! What makes this book stand out from his previous work is the deep sense of personal attachment he exhibits, when he tells the story of the decline in health, and then the death of his father. Dr. Atmaram Gawande, who was a surgeon (Urologist) in the US as well. The vivid descriptions in the last few pages are so strong that one can imagine the scenes unfolding right in front of their eyes. And if they happen to be people like me, who spent any amount of time working in the confines of a Critical Care Unit, they can imagine the sights, sounds and smells that they strive to block out from the forefront of their memory. Incidentally, I lost my uncle, who I was very close to, a couple of weeks ago. 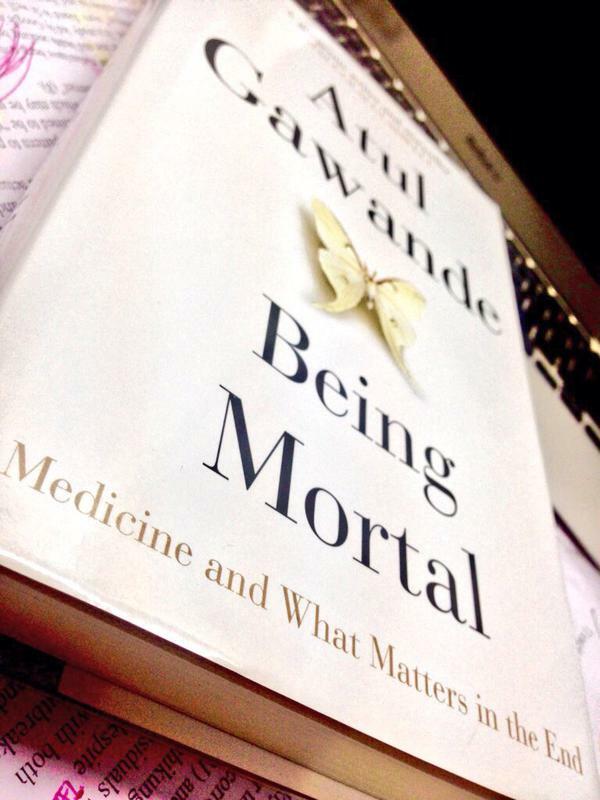 He had been suffering from cancer which eventually combined with the ravages of old age took him through the very steps of death and decline that Gawande speaks of so eloquently in this book. Having this experience at the back of my mind made reading this book an even more poignant experience and to be honest, it has made me stop in my tracks again, to question the veracity of forgetting about quality of life in the mad rush to prolong life itself. But before I end, I would like to throw in a major spoiler though. It is a disarming simple argument that Gawande makes in the opening chapter of this book, where he has caught my attention regarding the importance of this text. 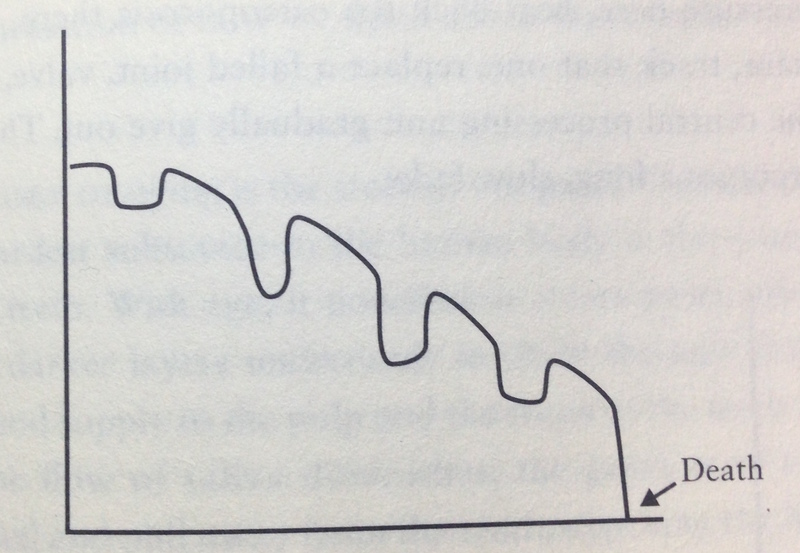 In three graphs, he has demonstrated how, over time, the experience of life has changed for us. 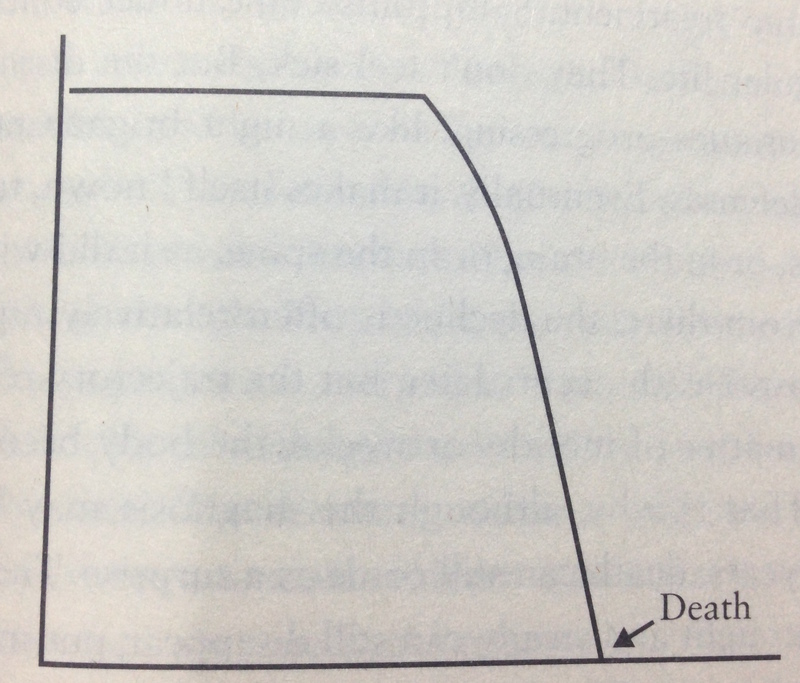 In an earlier era, when medicine was mostly snake oil and voodoo chants, death was a precipitous calamity (as shown in Graph 1 below). Something happened: cholera, smallpox, influenza, whatever… and after a brief period of suffering, we would slip into an irreversible slide towards death. This was followed by the era of the rise of medicine, where effective treatments for different ailments started to be prescribed. So, the pattern of dying from chronic diseases started changing. Now, an effective medical intervention would prevent the precipitous drop to death. Instead, there would be a series of ups and downs, where medical progress and its ensuing enlightenment enabled us to fight off the pathology, for a while, until it came back again, or until another cause kicked in. This would go on, until the accumulated wear and tear was too much to reverse and a final tipping point being reached, a slight nudge would cause the drop to death. However, when the issue came to old age and the issues of the elderly, the disease followed a very different course. 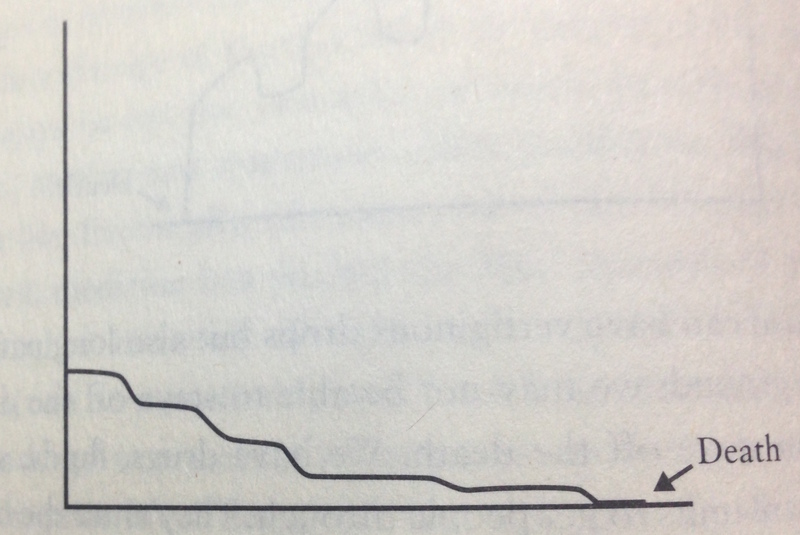 The trajectory of old age and its pathologies, unfortunately, drags on over time. With an exponential growth in the number of patchwork we can now do medically, it has become a war against the inevitable “crumbling of the body” for us. The decline goes on, slow and steady, while medicine and its trickery continues to work on patching up whatever it can, until, the final conclusion is reached in a meandering fashion, through a “long, slow” and often, painful, lonely and depressing fade. In my mind, this is Gawande’s best work till date and remains a book that must be consumed by all, not just medical practitioners. It covers issues as wide ranging as advance directives, the futility of modern medicine in the face of the ravages of cancer, health communication, skills in breaking bad news, promoting shared decision making, and of course, the main message: the need to be able to face our mortality, and work around the finitude of being to add life to our years and not merely years to our lives (to quote the cliche). In two words: Read it! 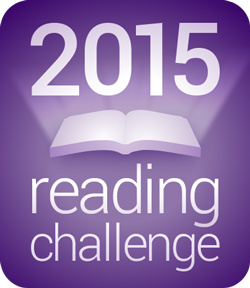 Tags: #50for2015, atul gawande, book review, gawande, reading challenge. Bookmark the permalink.